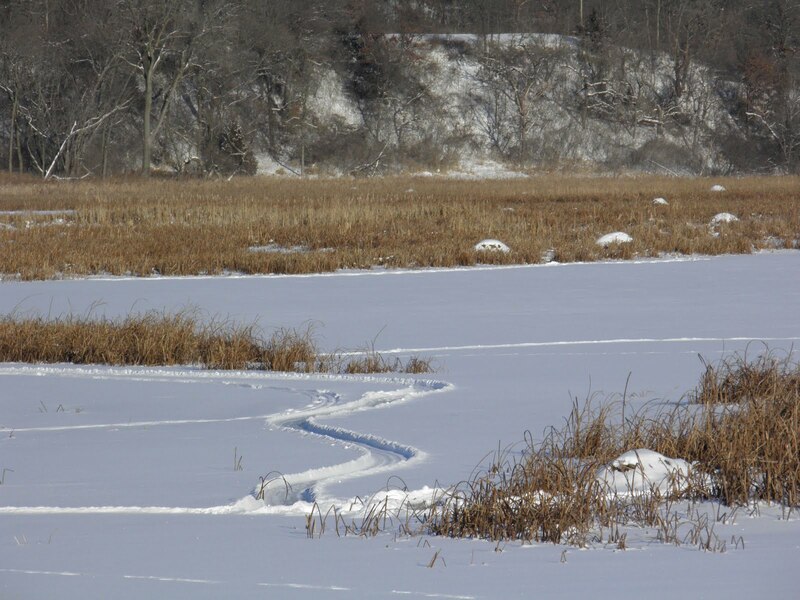 WINGS OVER ALMA: Where Are The MUSKRATS? We experienced an inordinate amount of rain in September in the Buffalo County, Wisconsin area resulting in flooding of the Mississippi River and its backwaters as well as the Buffalo River. Throughout fall we looked for the sign that winter was coming ... the muskrat huts, but there were few to be found. Did the prolonged high water cause the muskrats to seek dry land in other areas? There was lots of discourse on where the muskrats had gone. The first snow of the season fell on December 3rd and the muskrat puzzle was solved. If you drive by Rieck's Lake just north of Alma on Wisconsin Hwy 37 you can see white spots where the snow had settled on the roofs of the muskrat huts. You couldn't see them until it snowed because the huts were tucked up behind grasses and high spots out of the way of the high waters of the lake and the unusally swift currents coming down the Buffalo River to the Mississippi. Huts are used for communal living and for food storage. 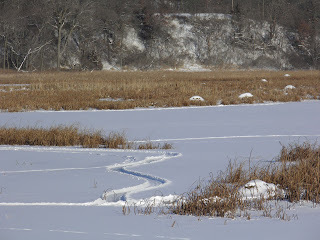 Take note of the muskrat trails from hut to hut. 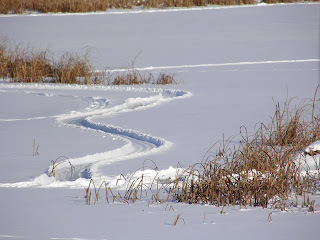 I love this shot showing the sway in the trail formed by the muskrat scooting from left to right in the 6 inches of snow. This is a great nature view for kids and a real learning opportunity. For more "kid friendly" info on muskrats visit the DNR Critter Corner.